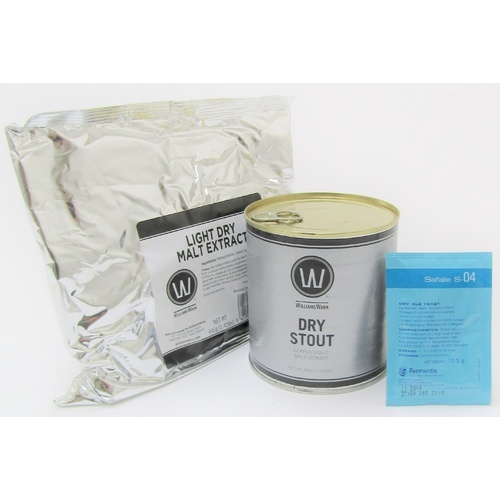 This Dry Stout has a black appearance from the crystal malts, roasted malts and roasted barley employed in the grain mix. The result is a great Dry Stout that has liquorice, roasted coffee and chocolate flavours dominating. The prominent hop bitterness level helps elevate the dryness, which comes from the roasted un-malted barley used. The yeast under the lid is an 11g pack of Fermentis S-04 yeast. Original Gravity of 1.045 (11.25°P), fermented to a Final Gravity of about 1.011 (2.75°P), resulting in 4.5% alcohol by volume, 32 Bitterness Units and 50 SRM/100 EBC colour.